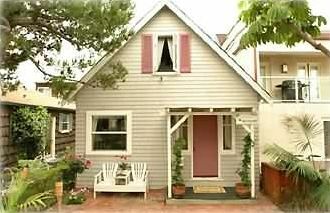 Mission Beach Adorable Cottage - Victorian Charm! Note: June/July/August stays are Saturday to Saturday only. The Most Adorable Beach Cottage Ever! You will love our 2 story Authentic Beach House! Built in 1925 - Very Charming. We are about four houses from the Bay and about seven from the Beach! Our cottage has two parking spaces. I have installed high speed Internet access for your convenience! Also free long distance to US and Canada! There are 2 bedrooms, one upstairs and one downstairs. Both with Queen Beds. There is one bathroom downstairs. The Living Room has a Couch that folds out into a Queen Bed with a comfortable mattress. There is a Large Deck with an Umbrella, Table and BBQ just through the french doors off the upstairs bedroom. Two Beach Cruisers, Boogie Boards, Beach Chairs & Beach Towels are provided for your pleasure! There is a laundromat on the corner of our court for your convenience. We are very close to the YUMMY Mission Restaurant, Saskas, shopping and more! This is the perfect place for your vacation! You will love it! I Love being a Mom and spending time with my family!!! I grew up in San Diego and as a kid I used to take the bus to Mission Beach on the weekends. I Love the Mission Beach area... I love to spend time there! It's beautiful! It's adorable and charming!!! It's a REAL beach cottage - comfortable and very very cute!!!! portable air conditioner is set up upstairs during the warmer months. 2 parking spaces on the property. Stayed 4 nights with daughter and 2 small grandchildren. Perfect size for us. Very clean and comfortable. Very convenient to the Zoo and Sea World. Loads of restaurants in the immediate area, Weather was cool so didn't get to enjoy the proximity to the ocean and bay. Darling house with everything you need! We had a delightful time in Robin's house. Great location too. Robin has thoughtfully furnished the house and thought of everything you might need to cook, things for the beach, bikes, beach towels, etc. Beds are so comfortable, which is important to my family. Thanks, Robin! We would love to come back again sometime. We loved our stay here. The location is perfect.Things are just as pictured, and the furnishings and decorations are perfect.Everything you need is provided- bikes, beach chairs. towels.and boogie boards. The kitchen had everything we needed as well. Our bed was really comfortable, the deck is great to hang out on. Shower has good pressure and lots of hot water. We couldn't find even the smallest thing to complain about if we tried. Just steps to The Mission, and not many more to La Playa Taco and Olives Bakery, both highly recommended Book this cottage, you won't regret it..
We had a wonderful time at Robyn's cottage. The location was perfect for walking to breakfast at the Mission, boogie boarding in the ocean or kayaking on the bay. Add 11.05% tax and an 85.00 cleaning fee. There is a $300 refundable security/damage deposit. I take Visa/MC for your convenience. 3 night minimum. No smoking/pets Holiday Rates are slightly higher. Summer dates are from Saturday - Saturday with a 7 night minimum.